Hi Anna, thanks so much for sharing your feedback. We're thrilled to hear you are enjoying your overall experience with us. Have a wonderful day! 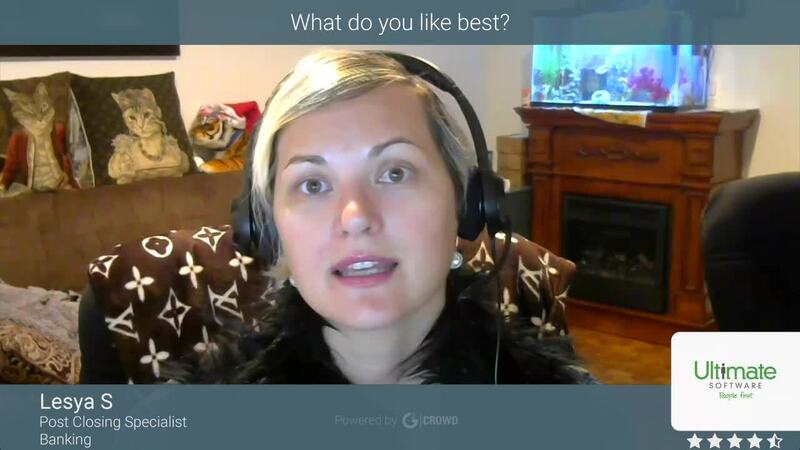 "A lot of online resources you can use"
Hi Lesya, thanks so much for leaving us with feedback. We're thrilled to hear you enjoy our time and benefits features. Have a wonderful day and weekend! I like how user friendly this software is. You really don't need a tutorial to go start using this program. I like that I can access my pay stub even a day before I actually get paid. I also like how easy it is to track my hours or to input vacation or sick time. I also like that I can pull it up on my phone if need be. I don't always start my day at the office so it's nice that I can clock in through the internet on my phone from any location. There really isn't anything I dislike about this program. Its user friendly and can be accessed on the phone or by desktop. Ultimately I think it is better on a desktop than on a phone but it's not a huge disturbance using it on the phone. I have noticed that I can clock in through the internet version of Ultipro but not the app version however so that is something that's odd, but it's not really a dislike. Ultipro is great to use for HR purposes. I would recommend companies using it as it is user friendly and makes tracking all payroll related docs. I use this for payroll and logging of hours. So on a larger scale our HR department uses Ultipro for all the employees for tracking of hours, using it for pay and benefits. the benefit is that it is easily accessible. "Human Capital Software All In One"
Some templates that already come by default with this application for different tasks, are two basic, in a tale of these characteristics, with the recognition that it has, and with the price that it costs, one expects that each detail is elaborated in the best way, more features are needed, for example, in payroll templates, these are very basic, and during its use, it has had to be modified manually, in order to make better use of them. the different departments of human resources have been simplified, to work as a team, thanks to the connection of Ultipro, this entire department, turns to the same goal, to reduce costs, and working time, with a constant communication between the different members. of this sector in our company, a team has been consolidated that can fully comply with the tasks to be carried out in an effective, practical and fast way. "excellent software for all your work info"
I like that i can easily access ultipro from anywhere. I can use it on my desktop at work or on the app on my phone. It's efficient and simple to use. The system rarely crashes and always works wonderfully!! there's not much that i don't like about ultipro. The one thing however would be the login. If you forget your password and you reset it, you can not pick a password that you have used in the past. other than that its quick and easy. Ultipro has access to all of our pay stubs and w2 forms. It keeps everything nice and organized and you have access to it in the palm on your hands. Hi Mayra, thanks for your feedback! We're happy to hear you enjoy our reliability and accessibility! Have a wonderful day! "Basic tool for human resources managers"
What I like the most about this HR manager is their speed, it's quite simple and quick to navigate all their sections. The daily task, the upload of documents and the updated reports on employees are also implemented very effectively. They have recently released a mobile application that, although it is a really useful addition, I think that they still have to improve the design and configuration a bit, since there are still a few errors in that sense. Having software in the area of human resources that facilitate tasks in such an important area is basic. This software in particular has useful features, well configured, facilitates communication and comprehensive management in this area. It has served to have a more complete and updated report on employees, facilitate communication with the human resources area, facilitate the upload of documents. Also the daily tasks are a great addition. 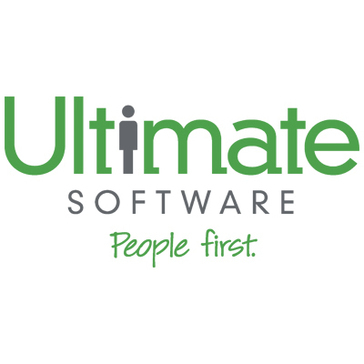 "The Ultimate Experience - An update"
Ultimate Software has allowed our company to do more with our HR information in a shorter amount of time. We are able to create reports to give to upper management, department heads and supervisors in a timely fashion versus our previous HRIS system. We have the ability to onboard employees with little worry and the software is cloud-based so we don't have to worry about will we be able to get it to open on a machine in any of our offices. There is so much we can do that it is makes me think why did we wait so long to upgrade systems! The only thing I wish I could have from the UltiPro/Ultimate Software system is a dedicated icon on my smartphone where I could load my system administration abilities versus logging into the web to get there. But the great news is that we are testing the Mobile app next week! It is finally become a reality so I won't be able to say there is anything I don't like about the program. Other than that, which is more of a want than a dislike, I believe the system is great. When looking at UltiPro you should remember that you are choosing a system for more than just the cost, you are looking at the system saving your staff time and effort. This system has allowed us to save both of these for the same price as what other systems would have cost us. We are solving issues such as: overtime abuse; going from a paper environment to a paperless environment; improving the tracking of attorney bar information; and finally, understanding staffing issues in our offices. The benefits we have realized have included: electronic file feeds for our employee benefits; paperless paychecks and open enrollment, to name just some of the benefits we have accomplished. Thank you so much for taking the time to provide us with feedback. We're so glad to see we've been able to help your organization save time on HR functions and solve real business problems. Have a great day! I like how easy it is to navigate and utilize. You could go in completely new to it and figure things out very quickly. The training area is very self explanatory and tells the user exactly what to do in order to complete the training. Onboarding is probably the easiest it could be on this software and only takes minutes to complete. I absolutely love it. I dislike how something the links are very repetitive. There are multiple training and development links and only one works. It can be pretty confusing and takes a bit of trial and error in order to get the correct one. But, all in all, it is a very minute complaint and I would not care if it was fixed or not. It is a very simple yet effective software that anyone could use. It is nearly completely fool proof and does not bring many problems. I have not personally ran into anything that I could not fix with a previous page button. It is the best software in a workplace that I have come into contact with in my working career. It helps the process in hiring and training new employees. Also, it gives easy access to see pay stubs and W-2 and W-4 forms when employees have questions so the can access it themselves. Once they get ahold of it the first time, it is smooth sailing from there. I like the fact that I can see just about everything within this one application and I do not have to navigate into multiple solutions to be able to find the information that I need to manage people and the department. I do not have any complaints as it serves my needs well and is easy to use. Many features to use so utilize them to the best you can! We are using it for Performance Management, required ERISA notices, benefit guides and Time and attendance. Having everything housed in one application provides us with the benefit of being able to see all of our HR managed items at once and not have to search all of the network or multiple applications. It also provides us with various management reports and tools to effectively manage our teams. Hi Chad, thanks for much for leaving us with feedback. We're thrilled to hear you enjoy our unified solution. Have a wonderful day! "Much More than just a Payroll System"
Onboarding - we were able to go almost 100% paperless and enter new hires before their start dates. Mobile - Great way for employees and administrators to access data and approve requests. Cognos Analytics - a powerful reporting tool that allows report scheduling and automation. As a long tenured customer(over 10 years), we have had customizations done over the years for features that are not yet available and once they become available, it is difficult to unwind these customs. But we are glad new features are constantly being added. It's a great solution and is much more than just a Payroll system. Going Paperless. Scheduling and automating reports and data feeds keeps us from doing a bunch of manual work. Hi Glenn, thank you for your feedback. We're thrilled to hear we have helped your organization go paperless. That's huge! Have a wonderful day and weekend. Our organization has over 120 HR/payroll operators working in over 40 companies/FEINs, and although we are standardized, we are decentralized in terms of the HR and payroll operators. With UltiPro, we have centralized access to real-time data that empowers strategic planning and decision making. UltiPro gives us the information about our people and locations that is used in determining the current condition of the organization and to highlight areas for opportunities to move us forward. We have users in both the back office and the web product. Ultimate continues to develop the web product so back office functionality is moving to the web, making work easier. However, there are still tasks that are somewhat easier and faster in the back office, but there are now functions on the web that are more efficient than the back office. Presently, we are using two web based products, specifically UTA and Recruitment that have upgraded versions available, but our migration continues to be delayed, both for over a year with no ETA in sight. Make sure you are thoroughly ready for your implementation by knowing what your expectations are and what you want to achieve by going with UltiPro. It's important to be confident in the implementation team, making sure they understand your needs and your organization. We had to commit more resources from our corporate and HR/payroll teams after implementation than anticipated, but that's with moving from a service bureau to a SaaS environment. Prior to implementing UltiPro, we have difficulty gathering centralized data on our organization. Now, we not only can access the data needed to realize HR trends and basic data, we can better control how data is recorded to provide consistency across the organization. Being a federal contractor, consistency and accuracy are of the utmost importance in being able to demonstrate the organization's stewardship of the funding granted. Also, the ability to import data from other vendors and export data via USED is a great help. Web Services is also being used to keep our active directory in sync with the actual active population. Hi Jeana, we appreciate your feedback and kind words. We love hearing how we have helped you improve your organization! I just wanted to let you know that I have shared your comments internally to help us continue to improve. Thank you for being such a great partner and member of our Ulti-Family! "Adequate for basic functions. Clunky interface, not a 'Wow' experience"
Basic functionality is sufficient--you can access HR documents, and when you get used to navigating the clunky interface it does surface benefit information. Works okay for the most basic functions (i.e. submit time-off request, view employee handbook, view most recent pay stub). I do like that you can favorite specific pages and thereby customize your version of the menu. The search doesn't really seem to function. Very difficult for hourly employees to enter time worked (worst of the ~5 systems I've used). Goal creation / assignment system is needlessly overcomplicated. Insourcing our formerly outsourced HR, saving money. It doesn't seem to have any actual advantage over other HR software we've used in the past--i.e. we weren't able to take any complex functions online that we couldn't in the past. Just cheaper, as far as I know. Hi Katie, thank you for your feedback. I just wanted to let you know that we value your insights and I have shared them with the team to help us improve. In the meantime, if there is anything I can do to improve your experience, please email me at feedback@ultimatesoftware.com. We hope you have a wonderful day. "Ultipro is highly intuitive and combustible "
Ultipro is highly intuitive and the user experience customizing the app is simple a helpful, it is full of features and functionality, ultimo has a great look and feel the application has been wisely designed and you can follow complex steps without even noticed and achieved a general goal thru all the company, Ultipro is simple and easy to use and full of great and useful features. Time off request is not great too much detail information on it, I would like to see a better template to fill out the time off request, I would like to obtain better reports of general aspect of the company, results and goals achieved by the work force within the organization, Ultipro might be lacking an API the allow internal apps extract and post information, this will make a huge plus the attach processed to the key goals. The payroll and HR management that gives solutions instead of headaches. General portal, job certification, benefits, salaries, responsive, excellent mobile app and web security management, this is not just to handle time off, you can communicate and keep track of the important event of the company using the great and vast amount of features of the web application and the mobile app, the employees are getting the habit to resolve their questions using Ultipro before contacting HR, this is great in HR resource and investing their time bringing new ideas and solutions to the organization. "Big Fan of the Ultimate Software System and it’s People"
We love the ability to be able to customize the system for our business needs. We have been able to brand our system to our company. The system is very intuitive; even our not so savvy computer people can manage their own data and find everything they need on UltiPro. The system itself is very easy to use and works fantastic, from time management, to payroll, to paying our taxes and creating amendments, to performance management and reviews. It is one stop shopping for us and our employees. The interfaces can be long and daunting, but we have found solutions for those. I would highly recommend UltiPro to any company. The system is fantastic, it does exactly what you see in the demos, the reporting is amazing, and the people at the company are knowledgeable and helpful. We were able to consolidate multiple databases and reduce hours of auditing between the systems. We gained fantastic reporting capabilities we did not have before. This reporting includes bursting reports to report owners on schedules, sending out form letters to employees, and much much more. Huge time savings. We have been able to link our performance management with our Compensation and Salary review for one comprehensive cycle. Hi Danielle, thank you so much for the kind words! We value your partnership and are thrilled to have you as a member of the Ulti-Family. "UltiPro- Definitely a winning solution"
One of the best things about UltiPro is having Recruiting, Onboarding, HR, Benefits, Payroll and Time Management under one single login and site. I log in each morning either as a Super Admin or a Payroll Admin and Processing Only depending on where I need to be. It is fairly easy to lookup answers to questions I may have or view one of the Quick Tours and Tips which is right at my finger tips. I don't have to look very far to be exactly where I need to be. Also the Rapid Response team is incredible. They are very knowledgeable and work so hard to resolve issues quickly. Follow up is amazing. The thing I dislike about UltiPro is actually a positive for Ultimate Software. They are growing so very fast and need more help. The Tax Service is slower resolving and completing cases than I would like to see. Also some of the reconciling reports could be better. It is sometimes difficult to match up credit and debits with our bank account. More detail would be awesome. Sorry one more thing- navigating in Customer Service Portal isn't the best. When you open case attachments you have to close and go back to the beginning to enter the case again from the start instead of remaining within the case when you close the attachment. And when calculating an instant check before you need to start the next payroll batch, you have to start the payroll, enter the instant check and then undo all processes just in case an employee makes a change to their record that will affect the next payroll. The start and undo process is a little frustrating. Payroll registers with year to date numbers along with the payroll period would be nice too. Ultimate Software is a great company to work with. I do suggest making sure you plan out to go live on January 1st. Do not try to bring over year to date numbers like with did with a October 1st go live date. Make sure you have plenty of time to validate and verify everything in the implementation process. There is nothing easy about implementation no matter what company you are doing business with. This may have been smoother if our implementation manager had more face to face time with us as the customer. Trying to do everything long distance doesn't always produce the end result you would like. More training up front. I am a one person payroll department for over 1500 employees so UltiPro is easier for me to use and I feel very confident about the accuracy of the calculations. The benefit for our company is that they can still get by with only one of me (for now). Having everything I need in one place is so very helpful. There are other things I could ask for to make processing payroll even more user friendly but I am so much happier with UltiPro than our previous HRIS/Payroll system that I feel pretty good about this gift. Hi Colleen, thank you for your feedback. It’s so cool to hear you are processing payroll for 1,500 people by yourself. You are a rock star! We value your feedback and I have shared your comments with the team to help us improve. We hope you have a wonderful day! "The best move we could have made!" Oh, there are so many things. I think most importantly, it's the reporting functions. Not only do I have hundreds of standard reports already created that I can modify, but I have the capability to create my own reports to meet specific needs within our company. I'm in report heaven! There are some back-end features I wish I had access to, instead of waiting to submit a request and working with a tech to resolve them. Simple things, really, but our specific plan channels back-end requests through our tech support. However, with that said, the techs are jolly quick at responding and solving my issues. Take the time to test out the features of UltiPro. It really is amazing how much time and thought they have put into each of the features. In addition, they are always listening to customers and updating the software to meet their needs. In fact, at their annual conference, they solicited ideas from the attendees for a project for the IT team to select and program during the conference. This year they created a workflow to track LOA. Our open-enrollment process has been streamlined to reduce tons of paper and hours of detailed data entry. Paper enrollment forms are no longer required. I can now generate a report immediate after closing the online open enrollment and submit that data directly to our vendor feed for processing. It has literally eliminated two weeks of data entry into our old payroll system. And, creating year-end ACA reports has become very simple to do. Hi Jeanne, thank you for the kind words. We are thrilled to hear you have streamlined benefits processes and ACA reporting with UltiPro. I hope you have a great day! "Very robust, tons of functionality"
We use all modules UltiPro has to offer so we get full integration from time to payroll to benefits and so much more. UltiPro offers a seamless transition from one to the next so that information is shared across all platforms. Most of what I dislike are smaller, more nitpicky items. There's nothing about the overall program that I think is poor. I'd like to be able to switch between pay groups when already in the Payroll Gateway>View or Edit Results/Instant Checks. Make sure to set up the system according to the experts at UltiPro or your third party consultants. This is a huge system that needs to be done right. Don't try to do it haphazardly. The full on integration has solved a world of problems compared to having to export and import data through various channels. All of that data manipulation from system to system leaves room for human error. With it all housed in one place, there is much less chance for mistakes. "Best solution for our business... we know the system because we built the system!" We went live in 2016. As my "title" mentions - one of the key advantages is that we built the system... tables, codes, and all! But as a result, we know our own system and can make changes and adapt to our growing business needs very easily. Plus - if we are lost... the Ultimate Community is one of the best social networks I have ever seen. There are so many resources available to help you succeed - there is no way Ultimate can't work for your business! Because the resources available are so vast - it's sometimes hard to figure out exactly where to go to find your answer. You know it's out there - but sometimes you get frustrated in your attempt to find it. Second thing - UTM needs a makeover. It's reporting functionality and the fact that the hours worked are not really linked to CORE - is very limiting to our business needs. The biggest implementation tip I can provide another potential customer is that you definitely need the resources to implement this system. We had a dedicated project manager on our HR Team that implmenting UltiPro was their sole purpose when brought on board. We were then able to slide her into a HR Manager role following the project... but it was invaluable to have one person solely focused on the project. We could then use the additional HR team members to assist; but keeping in mind they were also focused on their "real jobs". Upon implementation, we maintain the system with a FT HR Specialist. Our biggest undertaking right now is that we just implemented Performance Management. We saw a 90% compliance for the first time doing reviews electronically - HUGE SUCCESS! "Human Resources Manager - HRIS/Benefits"
Having a single system that can handle front to back life cycle of the employee from application, onboarding, core, payroll, performance, etc. Also, Generally their customer support is good. I think that Ultimate Software is over stretched with their products. They seem to be chasing and creating the next best HCM "Thing" (i.e. Xander, Perception, etc. ), however this is being done at the expense of other core products. There are tones of basics enhancements that have been suggested and Ultimate keeps commenting that they are in the works, or being delivered, but yet we don't see anything. "UltiPro gives you the Ultimate HR and Payroll Experience"
The configurability and ease of use of the portal. There is nothing that I truly dislike about the system, but if I have to pick something, the UltiPro Time Management portal could be updated to be a little more user friendly. We have 1 payroll person on staff and our payroll is bi-weekly, paid on Friday. The payroll process used to start at noon on the Friday before payday, and would be complete typically on the Wednesday afternoon. Today, I still have 1 payroll person. She starts her payroll process now on Tuesday morning before payday, and is done by Wednesday, typically by noon. By switching from the service bureau model to UltiPro, we are saving approximately 14-16 hours each pay period that can be allocated to other tasks during the pay period. UltiPro is a total game changer. Our performance management process has seen dramatic improvement in both employee experience as well as manager/employee communication. It all started with our activation of the UltiPro performance management tool. "Why Olmsted Medical Center Love Ultipro"
I love the integration of payroll, HR, Recruiting. When we first merged payroll and HR into 1 system, it was amazing the errors we discovered that were occurring because the 2 systems were not talking. My other most favorite feature is the security. I can develop a security role to fit just about any situation needed. I have complete control over how secure I want our environment to be. Ultipro takes system security VERY seriously and even alerts us to strange activity. The other thing I love is in the last couple years, they have opened things up to allow your to configure your environment on your own....for free. YES FOR FREE!!! They call it Platform Configuration and it allows you to create your own fields to report on. Plus you can change menu titles. LOVE THIS! I am a reporting/database geek. I absolutely love the reporting tool, Cognos, that comes with. There is nothing you can't do with it. My only real complaint is it can take awhile from the time you open up a ticket until you actually get someone to help you. They did put in place a Payroll Live Chat so if you are in the middle of processing your payroll, you have a way to get immediate help though. Sometimes I wish there was more instructor led training. While it's nice to save money and do it on-line.....nothing beats having an actual instructor in the room. AND being able to lock yourself into that class. When I do virtual at my office, I'm constantly interrupted. Take time to talk to other customers. We are a medical institution and have done some inventive things to make this product work for even the credentialing piece of our business. We have also built an FMLA tracking capability with platform configuration. What aren't we solving? Managers love the access they have to applicants and their employees. Employee's love being able to do things on their own w/o having to make a trip into the HR Office. We have identified overspending when comparing scheduled FTE to Paid FTE which was not done prior to the system merging. We have figured out we have a problem with our PRN staff working to a total of 34 FTE'd positions. The question was "Where is this FTE creep coming from?". Yep-that's where. Having the payroll data merged with the HR data has opened up a world of reporting. We are now fully using Performance Management and our supervisors LOVE how easy it is to do a review now. Our review completion rate has come up. Hi Jennifer, thank you for taking the time to provide us with feedback. We're happy to hear you enjoy our unified solution and your overall experience with us. Happy holidays and have a great day. "The Ultimate Experience - A New Perspective"
UltiPro has allowed our company to do more with our HR information in a more realistic timeframe. The end user experience has enhanced the usage of our HR applications when compared to the past. The real-time information including reports and dashboards is more aligned with our other systems.The ability for employees to be able to navigate seamlessly and manage their information is made an impact. The ease of use with the Core HR applications has made a great impact on our employees. There is quite a bit of limitations with the workflows (business processes) and the learning application (Schoox). I think there is a lot of opportunity with the learning application from and administrative perspective because there is limited functionality when compared to other learning applications. The ability to be able to create an ad hoc business process and have more flexibility around the approvers org levels would be great. The ability to see all compensation history from one place for all employees would be a nice to have. If you are considering UltiPro. I would ask the hard questions and really get under the hood of the car, so to speak. For a company with a Safety culture and very specific requirements around learning. I would source multiple options to compare. UltiPro Learning is still in its infancy and it was not quite developed enough to be delivered. While the overall customer service experience is good, there are still some internal issues with customer service when dealing with certain modules. The compensation reporting is not as intuitive and easy to navigate. We are working on going from a paper environment to a paperless and email environment. The ability for all of our new hires to being their employment utilizing a system that integrates is a great thing. Our payroll team is able to reduce the complete the payroll process. The integration with internal business systems and other applications has reduced the amount of time spent on the manual processes. The demographic footprint of our business has allowed us to rollout things like benefit enrollment, compensation management, and onboarding seamlessly. Hi Jaronika, thank you for your feedback. We’re happy to hear you are enjoying our Core HR capabilities. We value your feedback and I have shared your comments with the team to help us improve. We hope you had a great time at Connections and have a wonderful day! It's hard to pick just one thing I like best about Ulti. The product is very user-friendly and customizable to meet our needs. In addition, customer service is the best I've ever had with any other software (Ceridian, ADP, SilkRoad) and the company is dedicated to continuous improvement. This is a tough one, honestly. We are still working to implement different parts of the system so I really have yet to run across something I truly dislike. UltiPro has a clear dedication to continuous product improvement, and truly takes customer feedback into account when working on future enhancements. I would highly recommend this solution. When we implemented Ulti, we went from having 20 separate distinct payroll systems to having all of our data in one place. As you can imagine, the ability to finally report company-wide data has been a huge eye-opener. In addition, being able to automate things like Recruiting, Open Enrollment and Onboarding have been huge time savers. One thing that I like best about UltiPro is that it is very easy to use! I have had to train others on how to use it and even without much technology experience- I have been able to show others how to use it! I also like that I can keep all of my paystubs in one place. There is nothing that I dislike about UltiPro! I am still rather new to using this site, so maybe things will come up. But at this time, I have no issues or complaints. Our company has used UltiPro since I have been here. I found it easy to learn, easy to sign into and very user friendly! Some business problems that we are solving with UltiPro is having all timecards, vacation time, time off, pay stubs, etc in one place. This makes it super easy for us to direct employees to one place! This saves us a lot of time from an administrative point of view. Thank you for the kind words. We hope you have a wonderful day and weekend! When we made the transition to UltiPro the number one item I was looking for was all around better customer service and experience. We were with a previous provider that we could not trust on multiple levels. The second we met our sales rep and then into starting activation with UltiPro I could tell the difference, everyone was SO knowledgeable. We already felt valued as a customer. Now almost 3 years later we can still call Ulti and I have the trust of them answering the phone and providing great customer service. The payroll process also runs very smooth. There are a few benefit items that I think could be improved without upgrading to Benefits Prime. We would love the functionality to future date a life event. It is one of the best decisions we have made in HR in the past few years to make the move. UltiPro runs smoothly and I know I've mentioned trust multiple times but it is a huge factor in choosing a new provider. We were able to streamline our payroll process with multiple items including Pending Pay. We also utilized UTM to send out automatic reminders to managers to let them know of open and unapproved timesheets. Hi Lianne, thank you for sharing. We're thrilled to hear you are enjoying our customer service and payroll processing. We hope have a wonderful day and weekend! "A system with a purpose"
UltiPro is or can be a one stop shop for all things employees and HR. After using it for almost three years, the products continue to be enhanced and improved and it has streamlined some of our disjointed processes and centralized procedures. The one module we would like to see improved is the Performance Management module. The Talent Module, namely Performance and Succession Management, is not cohesive and that is the one area where we struggle to get all of our managers to use. Centralized processes for a very decentralized company. I have come to realize that many employees do not login to the system until it's time for open enrollment, however, that one centralized process is hugely impact not only for the process but for the information that it feeds. About half of our company is using the Performance Management module and we are striving to get 100% use for the same reason as OE. Also, reporting is high on our list - giving good data to our managers. The more information we get into the system, the better we can report on it. Hi Lisa, thank you for your feedback. We're thrilled to hear you enjoy our unified solution and continuous improvements. I just wanted to let you know your feedback is important to us, and I have shared your insights with the team to help us improve. We hope you have a wonderful day and weekend! Fully integrated HR system that creates a great end-user experience through the employee life cycle and has greatly helped transform our internal processes to be more streamlined and automated. Existing Time Management (UTM) has been the one piece that we have struggled to configure to meet our specific needs, particularly around PTO leave management. However, I think most of our issues may be resolved with the newer Workforce Management product. UltiPro has transformed the employee life cycle process for us and helped automate so many manual/paper processes we previously had in place. We love the way it streamlines employee data and the employee experience from Recruiting and Onboarding to Benefits and Payroll to Performance Management and more. The Business Intelligence reporting capabilities are also fantastic. The system has been an overall great investment, saving time and energy for our HR staff, managers, and employees to be more productive and enjoy the HRIS experience. Hi Andrew, thank you for your feedback. We're thrilled to hear you enjoy our unified solution and people-first experience. I just wanted to let you know we appreciate your feedback, and I've shared your experiences with the team to help us improve. Have a great day and weekend! UltiPro is very integrated and is very seamless to use. UltiPro has saved me countless hours of time in Open Enrollment, Benefits Management, Payroll processing, Life Events, and UTM. Tax Payment services is very slow at processing cases. Many times this is when we have a letter saying that we are late and getting penalties. The only other issue that I have had is with Open Enrollment reporting. It is nice to have the passive enrollment but we had to send our carrier changes only and was very tedious and time consuming because employees re-elected benefits. Dig into UltiPro. There is so much out there that you can use. They are always updating the products for the better and advancing with technology. Utilize the UltiPro communities because the best feedback is from other Ulti users. I have set up multiple phone calls with other users with challenges, likes, dislikes and has helped me in the long-run. Also, get on the webinars and using the learning resources. UltiPro gives us so much information and data at our fingertips. Process Improvements. We were doing a lot of processes with paper enrollment forms. Open Enrollment was very easy besides what I stated above with the reporting. Payroll only takes a few hours to process instead of a few days. Hi Megan, thank you for your feedback. We're thrilled to hear UltiPro has helped you streamline processes. We appreciate your insights and I just wanted to let you know I have shared them with the team to help us improve. We hope you have a wonderful day and weekend! I like how Intuitive it is, once you are in an employees personal information you have the side bar with "Items I can do", so helpful when new to the software. They also offer great reporting for payroll and general employee data. I also like the Onboarding functions, very easy for the new hire and the employer. All forms can be signed electronic and new required forms are easy to update. I also like that I can see a new hires status regarding the onboarding paperwork. I dislike that it's been a difficult task to receive notifications once employee has a Life Event and has submitted it for approval. It seem like a simple task to add an email to notify the Administrator that approval is pending. Ask your Account rep what they recommend in regards to training, so many options to select from. If you handles more than one aspect in Human Resources it can be overwhelming without proper guidance. There is plenty of webinars to guide you however sometimes you want that live person to speak to and walk you through the process. Don't get me wrong they are great at responding to any issues however being new to Ultipro when I joined my company early this year I was a little lost. Less emails coming in from employees asking the same questions, with the dashboard employees can find most answers without having to reach out to Human Resources for assistance, most inquires can be found on the home page. Hi Sonya, thank you for your feedback. We're thrilled to hear you enjoy our people first user experience as well as our Onboarding capabilities. We hope you have a great day and enjoy your weekend! The best part about Ultipro I would have to say is the ease of access and information that is available to all users. I can see exactly how many vacation hours, sick-time hours, and personal hours I have left at any time. I can also see updated information with every pay period which is nice. One of the only dislikes I have with Ultipro would have to be the fact that PTO information takes a while to be updated at the start of each new year. After checking today, it still says that my reset date is at the end of 2016. Another slight dislike of mine would have to be the section titled "estimated through plan" under the "PTO plans" option. I feel like this section could use more explaining. Even when I click the "help" option, there is only information about "employee paid time off benefit plans", which has little information overall. Ultipro saves myself, and others, time when trying to figure out exactly how many PTO days I have available. It is also the means of which I submit my logged time for pay and saves the hassle of having to use paper or other programs such as microsoft excel. It saves me time in finding and accessing my W-2 forms around tax time as well. Hi Paul, thank you for your feedback. I just wanted to let you know that I have shared your comments with the team to help us improve. I hope you have a great day! "Managing a Challenging Payroll in Challenging Times"
Ulti has given us the flexibility we need to accommodate our unique environment. We run several different payrolls, all with different requirements. We are always able to address the uniqueness of each payroll. The customer service is very good. My only negative comment would be that sometimes my cases remain unresolved for longer that I would like for resolution. Make sure you have great implementation leads not only from Ulti but internally from your company as well. We are a multi-state employer with many location taxes. Ulti files all of our payroll taxes for us which saves us a significant amount of time. We also have a high percent of our employees that have wage attachments. We utilize Ulti's Payment Service feature to handle our wage attachment payments as well. This saves us not only time, but check printing costs and postage costs. "Ultimate Software - simply an oustanding service and support provider"
The system is extremely user friendly and very intuitive. I can rely on Ultimate Software to ensure all of our Associates are accurately and efficiently paid each week. I have not experienced any payroll exceptions that resulted in an employee being paid late, due to the system. The software makes my life easy from A - Z.
I sometimes struggle with finding areas to build a BI report quickly and easily. I don't always have a lot of time to create a report when senior management needs one, based on specific criteria, right away. I can say, however, reviewing the BI-Delivered Artifacts listing has enabled me to locate some of the same information, already built for me. My take away here is that Ultimate Software has already anticipated various common report needs for any size business and made our job easy by having a report available. I have worked with J.D. Edwards and ADP. By far, this system is extremely sophisticated, more robust, and most of all...easily able to learn with little no training, depending on the environment you are in. The Learning Center provides thorough instructions, live experience options and testing environments to ensure you are comfortable with the system. I currently do not have any business problems, Ultimate Software enables me to proactively identify any process/tax reporting issues at the forefront. Your support team is outstanding and I could not be successful in my job without them. UltiPro is a good all-in-one HR tool that allows you to see all of your own Human Resources, benefits, & salary information while also serving as a leadership tool to assist goals / employee reviews and understand employee history and salary information at a glance. This tool has also helped employees on my team to keep track of their own goals throughout the year. Additionally, I've found the tool to be very helpful in viewing company resources such as org charts, employee handbooks, etc. Unfortunately, the workflow is not as intuitive as I would like. For instance, it's not very easy to browse employees on my team, and I've found the action of assigning goals to be cumbersome at times. They have suggested walk-throughs to assist the user, but many times, I've been unable to quickly find the walk-through that suits what I'm trying to accomplish. Additionally, some of the terms used to define their tabs and buttons are not always clear. UltiPro is a good service all-in-all. I would recommend that adequate training is provided if you decide to go with this solution as it is not always super intuitive. The biggest business problem that UltiPro has assisted with is providing a real-time tool for employees to use to keep track of goals they have been assigned and create their own comments as they go. I think this really helps employees to understand where they stand with the team and the company and results in minimal surprises come review time. Hi Brandon, thank you for your feedback. We're happy to hear you are enjoying our employee goal and company resource features. I do see you have some concerns, I just wanted to let you know I have shared them with the team to help us improve. I hope you have a great day! "Okay product that is good for basic use for sure!" Ultipro has a ton of options of what is available to you; I've seen it now in two different companies. In both scenarios, the capabilities of the software were not utilized to their fullest extent. It looks as if Ultipro can do far more than either used it for. The load times and menus for initially finding information are fast to navigate. Information on different pages is presented clear as well. PDFs and other files generated by the system load fast. he presentation of the material, menus, hotlinks, etc. is unwieldy and jumbled. It is hard to sort through all of the pages past initial launch ones. Drop down menus, if you move your mouse off of them, disappear; in 2019 that doesn't make sense. The ease of use is definitely missing. As mentioned, too, I've seen it in two scenarios, one with a company of 2000+ and one with around 200 employees. All of the features are not used and yet you can still open up menus and pages that do not have relevant information; if thats the system, it needs to be fixed, if its the user/moderator of the business, they need to be encouraged to get rid of it from the systems administrator from Ultipro. Just not an easy and clean tool to use. Really look at the robustness of the product and see if it is overkill or not! Overall, if you are only looking for basic information as an employee its easy; find paychecks, find personal info, etc. As a long-term solution, unless you do a great job of training and modifying the tools and menus, its easy to get lost; both because of the interface is not clean and it has too many options. Hi there, thanks for your feedback. We value your insights, and I have shared them with the team to help us improve. We hope you have a wonderful day and week! I like that I can customize my page to have things I like easily accessible. I use the time clock entry multiple times a day so I set it up to be on my opening page which makes getting to it a lot easier. I also like that it is in general easy to use. I like that I can also access it on my mobile device as well as from my computer at any time. I wish it did't log me out so quickly but other than that I don't really have any concerns. It's easy to track things. I think UltiPro works great from the user standpoint. I'm not sure how easy it is to use for the HR users that have to use it to generate paychecks and other documents, but since it has other good ratings I'm sure it is just overall user friendly. Our company uses it for HR purposes and Payroll. It is great for being able to quickly view my current pay statement or to view past ones. I can also see track what I have accrued for vacation or sick hours at any time. Hi Marielle, thanks for your feedback. We're happy to hear you enjoy our custom-ability and usability. Have a wonderful day and week! "Great tool for large businesses - really cuts out middle man for useless paperwork"
It's a great tool that takes out the mundane paperwork. Before UltiPro, my managers had to collect our staff's time sheets (60+ staff) and then check them all for errors then process them. Such a waste of time. The tool also allows us to now request our time off and enter sick time from home. This is amazing as we can make more of a stride towards going paperless and managers just have to review the pending requests and make the approvals or request denied. Managers at one point had talked about UltiPro using facial recognition software to sign in and out. We are currently only using employee numbers but the idea of it is really cool. The main thing that I dislike about it is that we only have one machine so you need to go to this one area of the building before and after your shift. This can be a hassle as we are supposed to report to our offices for a shift change a little early and there can be problems with buses or traffic. Management have not been clear on whether or not they will be docking time if we are late or if it is forgivable. Some staff need to leave early (before midnight) to catch the last bus. However, this is more of a policy issue than an issue with the machine but the presence of the machine has brought about these concerns. I do not know if our company was using another system to process payments. I do know that managers had to comb through our submitted time sheets that we had to print and sign then submit. Staff would frequently submit incorrect time sheets. This system now allows us to skip that step. We sign in for our shifts and then sign out and the system automatically documents this for us. If we are sick or on vacation we just have to sign in to our account remotely online and input that information. I can't say if it is better than other software but if you are looking to implement a software then this is a great system and it's a fairly seamless transition. Managers can now do more tasks that are appropriate to their role rather then wasting time processing data that a machine could more easily do. We will now be more efficient and a bigger stride to going paperless. Hi Benjamin, thank you for your feedback. We're thrilled we are helping your organization go paperless! I just wanted to let you know we value your insights and I have shared your comments with the team to help us improve. Have a nice day! User friendly interface and one software can handle pretty much anything from compensation management to w2 to PTOs. It is easy to request holidays as well and to track what holidays were approved. Compensation distributs the taxes and the description very well. Some of sections are not easy to reach to and the headings might need some efforts to get there. It takes some to get accustomed to the software but once you get a hang of it, it is not difficult to use it. Keep digging and exploring, Ultipro could give you very detailed information if you try to look in the right places. Managing my pay history and other things like requesting holidays and maintaining my working calender. The software has the good part of having all the features within one single space which makes is a good software. Hi Siddharth, thank you for sharing your insights! We're thrilled to hear you are enjoying our payroll features. We hope you have a great day! UltiPro is very user friendly and easy to use overall. The program does a great job of keeping track of time sheets, and allows for customization. The main page walks you through the basics and through customizing the drop down menu on the left hand corner. since it's a good platform and is easy to use, I would recommend it. The only issues I've had with it from a user's point of view have been minor, and overall I really like the system. Hi Jennifer, thank you for your feedback and the kind words. I just wanted to let you know I shared your comments with the team to help us continue to improve. Have a nice day! "We have achieved huge efficiencies with Ultipro, now a totally paperless HR dept." Easy of use, product flexibility to meet our business requirements, customer service and support is awesome, free training for life allows all HR staff to receiving training on enhancements, unified database allows for powerful business intelligence reporting, talent management is awesome, recruitment and onboarding help engage new employees before day one, mobile access for employees and leaders. The products have set every need we have had since implementation in 2002. The company has continued to enhance their products and add new ones. Customer service and support has evolved over time and is exception when needed. Nothing to dislike. Reduced HR staff while expanding employee population, went from paper intensive operations to totally paperless HR function, reduced salary expenses using salary planning and budgeting module, provide employees 24/7/365 access to all their HR related information, extensive BI reporting provided to leaders and management teams. "Good software...not the most user friendly system though"
Payroll System and time cards work extremely well and has a lot of great information and tools at your disposal. Recently used the recruiting system. Really like the layout and ease of use! It's clunky in setup. While I think a lot of it's strengths is the information and tracking that is available, it's also part of it's downfall. I find it a little challenging to navigate and it just simply doesn't flow well. In general, I love it all. We did not have a true ATS when we converted to UltiPro so I am thrilled to have this system. It is much easier from the candidate perspective to navigate than the system I used at prior company (Kenexa Brass Ring). Onboarding for them is a breeze. I love the analytics available through BI. I can't really say there is a dislike. I would like it to be easier and more cost effective to connect to and post to outside job boards. The cost involved with putting that connection in place was to great given the number of jobs we have open. Take a close look - this is a very robust solution and they are constantly improving and adding features. Real time payroll and reporting has made payroll more effective and accurate. Access to analytics has offered much insight. Being able to go in and post date actions saves time and ensures better accuracy also. Hi Linda, thank you for providing us with feedback. We're thrilled to hear we are helping you streamline payroll and reporting processes. Jamie, thank you for sharing with us, as well. I just wanted to share in July, we rolled out a new feature which enables customers to provide an auto-sourcing code to 3rd party job sites. Our customers can find more information on this feature in the UltiPro Recruiting What’s New section release notes. I love how you can find everything you need in this one program. For example, my W2, paycheck stubs and employment forms are all electronically stored on UltiPro. I used this at a previous companies as well and it is great for organization and communication amongst the whole team of employees. Sometimes Ultipro crashes out of nowhere or doesn't allow me to access certain items some days but other days it does. I definitely recommend this to companies trying to stay more organized. It eliminates the need to keep someone's lose leaf papers all over the place. This organizes them all in one secure web based page. Definitely going green with this program! It makes it easier to find any employment form you could possibly need. When it comes time for taxes, you don't have to wait for your W2 to be mailed to you because it will be in the form electronically. Hi Kaitlyn, thank you for your feedback. We're happy to hear you enjoy our unified solution. We hope you have a wonderful day! I like the flexibility to create user defined fields. This has allowed us to be able to track things in the system that otherwise might not have been possible. I like the ability to provide feedback and input to Ultipro for updates to the software. The networking opportunities are appreciated and valued. That we cannot track FMLA in the system in a way that is truly beneficial. We can only status people out and I would like to be able to do more. This is great product and we have been very pleased. We have a great working relationship with our customer service team. The online training is a plus for us to be able to get people up to speed on new functionality without having to recreate the wheel. I only have great things to say about the functionality and the setup for most modules is doable with the guidance provided online. Ultipro is consistently looking for ways to improve their product. They take customer feedback seriously and what to know what we would like to see added to the product. They have upgrades to the product 2 times a year and as needed for compliance. Performance management has been much easier in UP. We have realized a faster turn around, managers appreciate being able to do their reviews online. Easier for reporting. Thanks for providing us with feedback. We're thrilled to hear we have helped improve your Performance Management processes - how great! Happy holidays and have a great day. "Ultipro is a solid performer"
Our non-technical employees easily adapted to Ultipro, embracing employee self-service. We have been able to engage our employees and increase the accuracy of their personal data greatly. System is easy to use with great reporting capabilities. Would like the ability to change the supervisor without creating a effective date in job, so when retros happen you don't have to alter history. Also would like to have compa-ratio in the core product, instead of just a calculated field in BI. As with any system, there are always pluses and minuses. While some systems offer complete flexibility, it comes at a cost. You have to be able support building out all of the different workflows and processes. Ultipro is a bit more structured, which allows you to easily get started and launch much faster. They constantly are providing enhancements and are responsible for all of the maintenance. Moving to Ultipro has eliminated a lot of errors in our old ERP data, since employees can now easily access their data. We have also cut our amount of paper coming through our department a great deal. I lOVE how I can see everything I need to see within the different pages of Ulti-Pro. If I have a question about something, I don't have to go to my HR person 80% of the time. I can check paystubs, and all sorts of information without having to play email tag with our HR guy. It's super convenient! I'm sure our HR guy saves a lot of time not having to look up info for every employee. We can easily look certain things up that would really just be a waste of time for a human to have to relay to us. Hi Jessica, thank you for providing us with feedback. We're thrilled to hear we're saving you and your organization time. Have a great day! "Strong HRIS and Payroll in the U.S., Globally - it's a bit glitchy"
Single employee record across benefits, payroll and HR, means that there is a genuine source of truth for the whole company. The modular approach enables us to deploy systems when needed and as we grow. They are genuinely releasing useful functionality regularly. Reporting - it's very very powerful, however, only if you can use it. To really leverage it you would need a background in SQL. They recognize this and are working on it. UI is good, but not great. The mobile app is glitchy but they are working on it. Time & Attendance management is run by a separate company and it's painfully obvious as it doesn't fully interact properly with the rest of the system. If you are a mid size company in N.America it is a very strong choice. If you need to rely on it globally, think and stress test carefully. Single source of truth for the company. Single portal for employees to interact with. "UltiPro is a breath of fresh air for timecard managers"
For someone who likes analytics, this platform is a dream come true. With sufficient training, UltiPro offers everything for users and time card managers alike. I think my favorite thing about UltiPro is the interface as it proves to be relatively intuitive once you've dedicated some time to learning the platform. The learning curve is pretty challenging but this is mainly due to using ADP for the last six years. Some of the functions, such as logging travel time for an employee, is a bit cumbersome and frustrating. Also, the time clock fingerprint scanner is somewhat annoying for a lot of employees - they don't like the robotic voice or having to punch in/out in sequence. The old ADP time clock was a little more flexible. Be patient with it if you just brought it on, especially if you switched from ADP. Some of the functions, such as logging travel time for an employee, is a little frustrating at first but gets easier with time. ADP has already been reliable but there was some issues with support and absence of desirable features. UltiPro was designed with efficiency in mind which is very noticeable when using it. From what I understand, switching to UltiPro has saved our company quite a bit of money and has cured some frustrations that others were experiencing with ADP. "Ultimate Software HRM is outstanding "
That it is full feature and robust HRA application that is SAS based. The on going system updates are done by Ulti after hours so our system is always up and available during business hours. Since it is web based it can be accessed from any location. We were also able to eliminate most check printing and use the direct deposit feature saving us a ton of money. They are so popular that when we want customs created we have to wait up to 6 weeks due to the heavy demand they have. Bu I have learned to plan far enough ahead of time so this really is not an issue. Payroll is now automated and the system confirms that information has been input correctly. Before we used Excel in physically took paper time sheets and populate hours into Excel. So tremendous time saver. Online recruiting now posting job to our site and it updates all job boards automatically and they creates a work flow when an applicant files out an application and brings it into our recruiting module automatically. Again a large time saver and prevents loss of paper apps. Thank you so much for providing us with feedback. We're thrilled to hear you enjoy our payroll and recruiting features. Have a great day! The system is very easy to use. The modules fully interface with the core. I have used four other HRIS/Payroll systems over the years and this is the easiest and most comprehensive system I have experienced. Some limitations and unavailable functions in Onboarding and Recruiting modules. Also, the timeliness of the payroll tax support. Make sure you perform your due diligence when considering another vendor. We spoke with the CFO's at each organization and felt that UltiPro was more inline with our business philosophy and looked to UltiPro more as a business 'Partner' than just a vendor. Efficiencies with processing payroll - dropped from 2.5 FTE's to 1 (one). Also efficiencies in reduction of paperwork for benefits through Life Events and Open enrollment. UltiPro's ability to allow free customization of feature that enabled it's available features within UltiPro software to customize it as per my implementation needs. The Federal Tax calculation in our existing Ceridian software was configured incorrectly and this wasn't uncovered until the organization decided to change and upgrade the payroll processing software with the more advanced and updated UltiPro software. Other integrations with OTL, Workday 27 were seamless and earning calculations (Garnishments, Benefits, ESPP) were smooth and with limited validation efforts were required. Product support by the Ultimate Software Organization was excellent and their SME's and Technical team was commendable. The UI and UX can be improved and modified to make it more cosmetically better. There are few screen/forms [ESPP integrations from Fidelity, Concur, Cartus, ADP] where customization took additional efforts and these can be improved for better experiences. * We monitor all UltiPro reviews to prevent fraudulent reviews and keep review quality high. We do not post reviews by company employees or direct competitors. Validated reviews require the user to submit a screenshot of the product containing their user ID, in order to verify a user is an actual user of the product. Hi there! Are you looking to implement a solution like UltiPro?